Eugenia began practicing yoga in 2004, as a student of contemporary dance in Scotland. She gained a Yoga Teacher qualification from the Sivananda Yoga Vedanta Centres in Spain and soon after began organizing yoga holidays in Sfakia, Crete. In 2012 she gained the Iyengar yoga teaching certification and is currently living, teaching, and continuing her own training between Athens, Crete and Rhodes. Eugenia attends workshops and classes with teachers who continue to inspire her, namely Constantinos Giannetakis, Donna Farhi, Angela Farmer and Martine Le Chenic. Her classes strive to create a safe and nurturing environment. The focus on the breath and alignment, as powerful tools for gaining awareness of the body and mind, is integral in her teaching, while also incorporating elements of her Vipassana meditation practice. Ultimately, her interest lies in finding links between psychology, artistic expression through various media and yoga, in light of a holistic approach to well being. Eugenia is also an authorized psychologist. 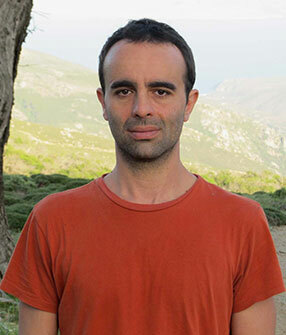 Constantinos Giannetakis is an enthusiastic and dedicated practitioner of Iyengar Yoga since 1992. In 1996, he moved to France where he also obtained his certification as a clinical psychologist from the University of Picardie. During that time, he studied extensively psychoanalysis both in the freudian and the lacanian vein and became particularly interested in the possible role of the immune system as an interface between body and mind. In the course of time, it became apparent to him that health is not simply the absence of disease but also concerns a state beyond that, which relates to the plasticity and lightness of the energy body. In 1999, he moved to London where he continued his study of psychoanalysis at a postgraduate level while also studying yoga at the South London Iyengar Yoga Institute, where he stayed for 3 years. In 2002, he gained his Iyengar Yoga teaching certification and became a member of the UK association. After his return to Greece in 2003, he opened the first official Iyengar Yoga Centre in Athens, where the first teacher training in the country took place. His teaching is alignment-based and aims at clarifying the biomechanics of asanas and pranayamas in a very precise way. It is also informed by the belief that the study of the body, nature and breath gives one the opportunity to understand the mind. Antonella originally studied Physical Education in Italy, her native country, and thereafter worked as a professional contemporary dancer/performer for 20 years with various companies in Italy, Belgium, Holland, England and Slovenia. During her travels in Thailand, she learned Traditional Thai Massage at Wat Po in Bangkok and Chiang Mai, and has now been a practitioner for several years. In the last few years, she also studied sculpture and video and is an abstract drawing artist. In 2000 Antonella embarked on her yoga path studying the Iyengar yoga method, in which she is a certified teacher (Intermediate Junior I). She has studied with various Senior Iyengar yoga teachers such as Cle Souren, Charles Hond, Annemieke Post, Willy Bok, Rita Polvoorde, Alexis Simon, Corine Biria, Zubin Zartostimanesh, Ramanand Patel, Christian Pisano, Rita Keller, and Devki Desai. In India, she followed summer studies with Rajiv and Swati Chianchiani at Yog-Ganga in Rajpur and at the Ramamani Iyengar Yoga Memorial Institute in Pune (RIYMI) with Geeta and Prashant Iyengar, Gulnaz Dashti, and Rajalaxmi. 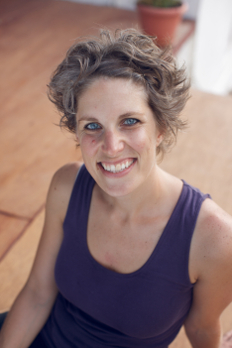 Travelling in California in 2013 she had the chance to follow classes with Manouso Manos and at the Yoga Tree Studio. Also open to other styles of yoga, she followed classes in the Asthanga Vinyasa tradition with Jean Claude Garnier in Brussels and took part in a workshop with David Swenson. Additionally, Antonella studied energy healing techniques and meditation based on the teachings of Barbara Brennan with Jan Janssen for three years, receiving certification. She deepened her meditation practice with a ten day Vipassana meditation retreat and has taken part in three Tibetan meditation workshops with Lama Zuepa in Huy, Belgium. 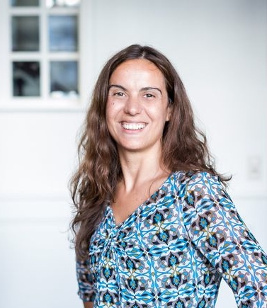 Antonella has been teaching Iyengar yoga in Brussels, and also in workshops in Greece, Spain, Germany, and Italy, since 2004, integrating the knowledge received from other experiences and techniques that crossed her path. She loves to help students find their own expression and freedom in the limited space of an asana (pose). She is interested in exploring and deepening the integration between the induced peaceful state of mind that yoga and meditation bring, and the creativity and excitement which flow and express themselves through human artistic expression that come as its consequence. Federica is a Yoga Alliance certified instructor who has practiced and studied Mysore Asthanga, Iyengar and other forms of yoga. 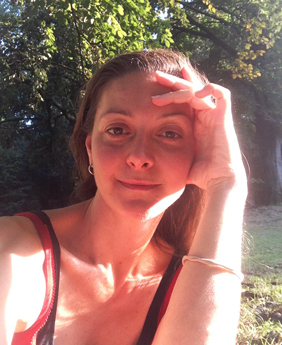 With a background in professional dance, massage therapy, craniosacral therapy and shamanic healing, Federica brings to her classes and workshops a wealth of background information in the mechanics of dynamic movement, energy flow and effective healing techniques. Yet, she teaches with an attitude of playfulness, acceptance and gratitude. 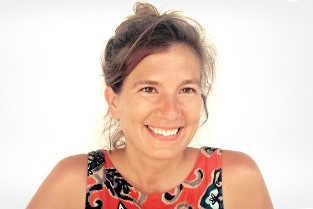 Federica is based in South Italy where she runs Maya Yoga. Dion began practicing capoeira in 1997 with Jimi McAvoy, a martial arts Master in North East England. In 1998 he moved to Edinburgh, where he trained and became a helper to Catriona Tocher, the founder of capoeira in Scotland. By 1999 he was put in charge of capoeira in Scotland. Mestre Chamine’s visit prompted his first trip to Brasil for four months’ dedicated training under the guidance of Mestre Gato and Mestre Marrom. Two other study trips to Brasil in 2001 and 2003 followed. 2002 marked the birth of the Capoeira Angola group mão no chão, running classes mainly in Edinburgh. Nowadays, Dion supports capoeira Angola in Scotland running workshops, training tutors and overseeing kids and special needs' classes. He has also been involved in theatre productions, has led personal training as well as instrument making sessions, alongside classes and workshops in Barcelona, Athens, the US, Rio de Janeiro, and Australia. 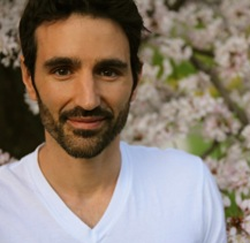 His passion for humanity, music, dance and community has led him to special studies in Greece for the past 2 years in psychology and therapies with reference to all aspects of his work. Dion draws upon elements of dance and music therapy, kinesiology, psychodrama, and role-playing, as he facilitates the playground on which we open up, play and express. He is currently teaching regular classes in Rethymnon, Greece. On the path to fulfillment and happiness, Victoria has been led to various courses and research on self-development on all levels. She began practicing yoga in 2005 and decided to further advance her knowledge by training as a Hatha yoga teacher at the Hatha Yoga and Budo Academy in Athens. Constantly evolving her studies in Self Realization and Spiritual Development through deferent paths and methodologies, she was inspired by Yoga systems such as Kundalini and Prana Vinyasa Flow. Her approach to yoga is rooted on freeing the body on the path towards letting go and raising the vibrational energy field for a more Unified – Radiant Self. Having experienced tremendous transformation in her personal life, she is passionate about sharing and teaching the techniques and principles that assisted her in the path to fulfillment and joy. She empowers people to express, create and enjoy through flowing body sequences, breathing and spontaneous dance, allowing the natural process of union of spirit, body and mind to occur. A graduate of the Kryon Merlight Academy in Greece, a graduate and a representative of the Macro-Consciousness Academy of Russia in Greece, Victoria is an intuitive consultant and Yoga teacher, conducting Self-Development and Awakening the Awareness seminars, webinars and retreats. She inspires people to approach the soul, mind and body with the same love and truth, for they all contribute to the happiness of the person who wants to live in thriving joy.